This year we are pleased to welcome back existing Summer sponsor ElecOnline. We are also excited to announce the Trek Distribution Centre at Stocksbridge as a new sponsor for the Summer Series 2019. HOW DO I ENTER THE SERIES? – Existing arm number: please put ‘New’ if you are new to our series this year, or ‘Lost’ if you have lost your number. Pre-registration closes on the 24th April. After that, just enter all your details on the sign-on sheet on the day. NEW RIDERS SIMPLY TURN UP ON RACE DAY. PAY A REGISTRATION FEE (£2) AND COLLECT YOUR NUMBER FROM THE NEW RIDER TABLE, before going to sign-on. You will then keep this number until you change age categories. NEW RIDERS SIMPLY COLLECT A NUMBER AS YOU SIGN ON. Numbers are to be returned at the last event they attend in Summer. Again, there will be a £2 registration fee. This is paid with the entry fee at the Under 8/10/12 signing on desk at their first event and not at the new rider table. NUMBERS REMAIN THE PROPERTY OF YCCA AT ALL TIMES. RACE TIMES – please see individual event pages. ALL OUR EVENTS ARE CHIP TIMED. CHIPS ARE WORN ON LEFT ANKLE UNDER YOUR SOCK AND COLLECTED A SAFE DISTANCE FROM THE FINISH LINE IN ORDER TO KEEP THE FINISH CLEAR FOR SPRINTS. PLEASE DON’T LEAVE THE AREA UNTIL YOUR CHIP HAS BEEN HANDED IN. DO NOT PLACE CHIPS ON YOUR WRIST, HANDLEBARS, IN YOUR POCKET OR IN THE CAR! A £20 CHARGE WILL BE LEVIED FOR LOST CHIPS. NO CHIP WORN ON ANKLE = NO RESULT! Please arrive in plenty of time to sign on. 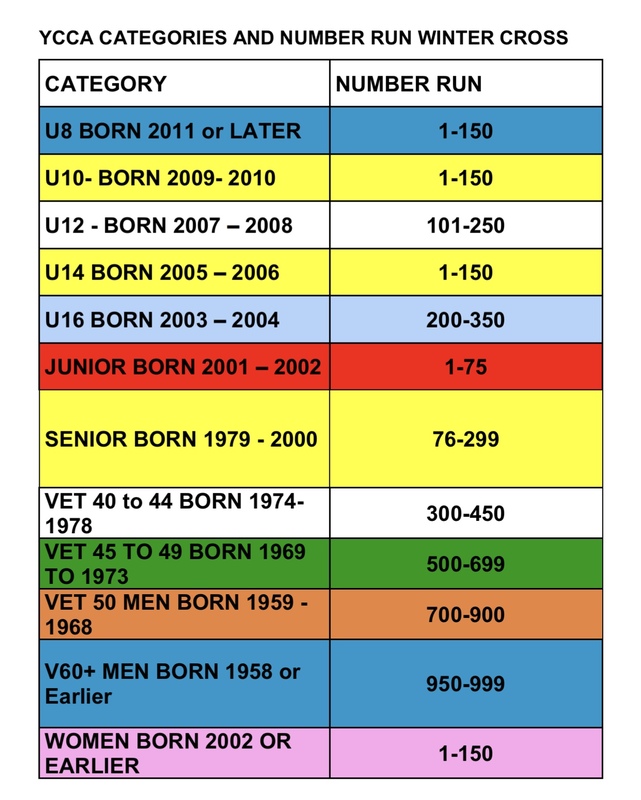 Sign-on for the U8, U10 and U12 races will open an hour before each race. For all other categories sign-on opens 1h 15mins before the race, so you have plenty of time. Podium Arrangements: There are no podiums for the summer races, prizes are presented for the series at the end of summer.